Polaroid Swing, an innovative moving photo app, launches on iOS. 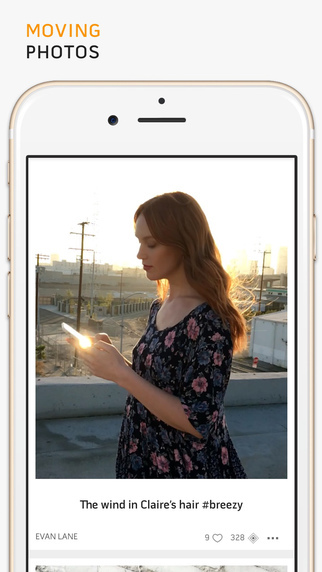 Released on the Apple App Store today, the Polaroid Swing app enables people to create and share moving photos on their iPhones with one easy tap and creates an engaging new visual medium to stand alongside photos and videos. Polaroid Swing is available for free on the Apple App Store, with a version for Android coming soon. The moving Polaroid photos capture one-second moments that magically come to life when you touch them or swing your phone. They combine the compositional quality of a still photograph with the vitality of a world that's always in motion. Polaroid Swing moving photos faithfully capture moments as we see them - the crash of the wave, the hair blowing in the wind, the blink of an eye. Polaroid moving photos can be easily shared on the Polaroid Swing platform and beyond via Facebook, Twitter and web links. Reverse the moving photo to perfect the moment. Take 3D selfies by rotating your phone around you. Select live filters for inky smooth Polaroid moving photos. Create your own moving profile image – and add a tint via settings. Connect your Facebook and Twitter accounts to find friends. No passwords to remember! Sign up with Facebook, Twitter or magic link.